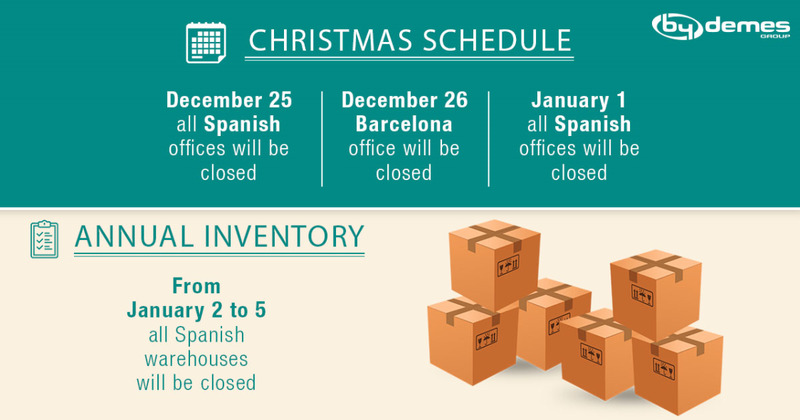 We would like to inform you that on Monday, December 25 and Monday, January 1 the facilities of all our offices from Spain (Barcelona, Madrid and Canary Islands) will be closed because of Christmas holidays. On Tuesday, December 26 the facilities of our Barcelona office will be closed because of the day of Sant Esteve. We will serve you as usual on Wednesday, December 27, Thursday, December 28 and Friday, December 29. Our Irish sales or Technical representatives will also remain at your disposal to continue offering the best service. And as every year, from Tuesday, January 2 to Friday, January 5 we will make the annual inventory and during those days all our warehouses in Spain (Barcelona, Madrid and Canary Islands) will remain inoperative. For this reason, we ask that your orders be properly planned and you can receive the goods on time as one of our commitments.